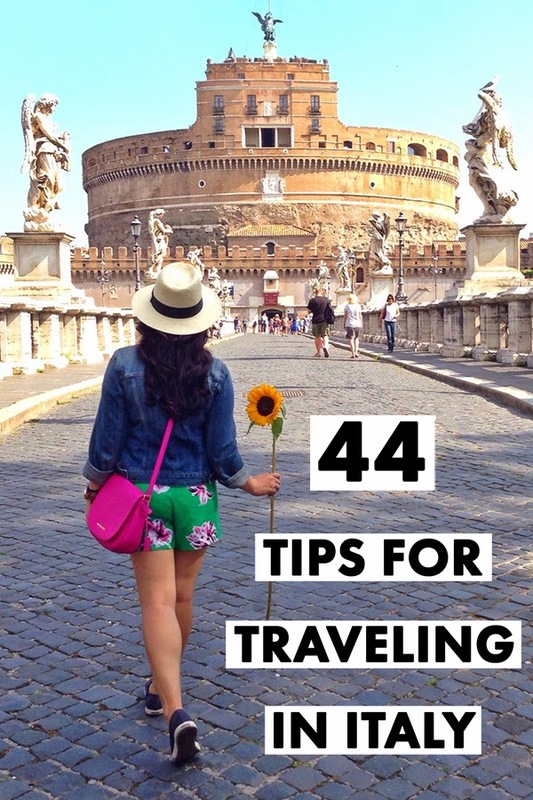 I get lots of questions about living in Florence and emails asking for tips for traveling in Italy. So I finally decided to put all of my tips and advice together in one place! I hope you find them useful and please share any tips you have. And don't worry, I update this list and its links regularly! 1. Plan and Pre-Book major sights and attractions whenever possible, especially if you are traveling in mid-March (spring break) or between May and July. 2. Don't use third party booking websites or companies. 3. Avoid restaurants with pictures of the food. You can read more of my tips for selecting restaurants in Italy here. 4. Make the most of the high-speed train. It is only takes an hour and a half to get from Florence to Rome or Florence to Venice, and only thirty minutes to get to Bologna! Plus the trains are comfortable and reliable. They are my preferred way to travel around Italy. You can purchase tickets online or through a local travel agent in Italy. But the easiest way is through the kiosk at the train station (and yes, an English option is available). If you are in Florence, the lovely staff at FlorenceForFun can help you get great discounts! Important Train Tips - The high speed trains called "Frecciarossa" (which goes from Turin - Milan - Bologna - Rome - Naples - Salerno), "Frecciargento" (Rome to Venice, Verona, Bari/Lecce, Lamezia Terme/ReggioCalabria), and "Frecciabianca" (Milan to: Venice, Udine e Trieste; Genoa and Rome; and down to Bari, Lecce) require you to pre-purchase a ticket and reserve a seat before boarding (you must also sit in your assigned seat. These tickets are like airline tickets and are only good for the specific journey purchased. Regional trains (including the Leonardo Express from the airport in Rome to the main train station) have open seating (within each class of ticket) and can be used at any time. You must, however, VALIDATE regional tickets (or any train ticket without a seat assignment) by inserting it into the yellow box located at the train platform. 5. Don't let anyone help you put your luggage on the train or take it off. This is a scam (mostly by gypsies) to force you to tip. If you are fine tipping, go for it, but be warned they are not the most upstanding characters. 6. Watch your bags as the train arrives and departs the station. Just incase somebody tries to hop on and steal something at the last minute. 7. Be prepared to lug all of your luggage down cobblestone streets and up stairs (and on and off trains). If your bag is too heavy or large to do this yourself, you need to rethink what you have packed! There are lots of streets and squares taxis can’t go down, so even if you cab it, you still might have another block or two to haul your stuff. Elevators can also be a rarity and you will often find random small sets of steps you have to navigate. 8. Bring a portable luggage scale, especially if you are traveling via discount European airlines. They are serious about bag weight. 9. Get up early every once and a while. Many cities, like Rome and Venice, have a completely different feel without the hoards of tourists. It is worth it to get an early start (especially in the hot summer) to get a different perspective of the city and to see many of the monuments not littered with people. Most places will not let you use your debit or credit card for smaller purchases and restaurants don’t split bills. I can't stress this one enough! 12. Look up if your bank has any affiliations in Italy (i.e. Bank of America and BNL) to avoid service charges and fees. 13. Unlock your phone and pop in an Italian SIM card. If you have an iPhone that is out of contract (i.e. over two years old) this is fairly easy to do and Italian SIMs are inexpensive. You can read more about how to do this here. 15. Don't put cheese on seafood pasta. Despite how delicious the cheese is here, Italians do not put it on everything. 16. Leave valuables at home. 17. Carry a copy of your passport instead of the original and leave the original locked in your room safe (or hidden in your room). 18. Separate your debit and credit cards. In case you are pick-pocketed, it is best to separate your debit/credit cards. I never keep mine together, so that if the worst happens, I always have a fall-back card. 19. Exchange money via your debit card at the ATM. This is the easiest way to get euros and ensures the best exchange rate. 20. Call your bank before leaving the country. 21. Bring a copy of your health insurance card. 22. Don't put your shoes or feet up on chairs or seats on the train. 23. Don't sign the petition against drugs! It is a scam to get your email and then sell it, or to get you to donate money. 24. Hold your wine glass by the stem. The heat from your hand changes the character of the wine when you hold the glass. Learn more tricks for tasting wine like a pro here. 25. Limit the amount of skin you show. This is for practical reasons, like entering churches, and because in general Italians show less skin. 26. Bread is not served with oil and balsamic vinegar. Although some places have started capitulating to American expectations. 27. You have to call a taxi, you can’t flag them down. 28. Drink the house wine, it’s delicious and cheap. 29. Start at the Roman Forum instead of the Colosseum. There is rarely a line at the Forum. Pick up or purchase your tickets there and when you are done, you can skip the line at the Colosseum, since you will already have your ticket. 30. Sneak into St. Peter's Basilica (Shhh!). If you are not on a guided tour but want to visit the basilica without waiting in another 3 hour line, you can "sneak" in. There are two ways to exit the Sistine Chapel (the end of the Vatican Museum tour). If you take the door in the back right corner (if you back is to the Last Judgment) you will head straight to the church without exiting the complex. This is how all the guides do it, so just blend in and if anyone asks, say you’re on a tour. 31. Visit the Vatican Museum at night. They now offer night tours, which can be reserved on the Vatican Museums’ website. 32. Skip the Vatican Museum line. If you find yourself in Rome without a reservation for the Vatican Museums and facing the typical 3-hour line, don’t worry you can pay (double) to skip the line. Find a shady looking gentleman hawking tours and a “skip the line” pass. These companies reserve blocks of entrance times and then sell them for double. It stinks that you will have to pay double, but it is still better than wasting 3 hours of your day. If you don’t want the tour, tell them you just want to skip the line. 33. Eat as far away from major attractions as possible. The public drinking fountains throughout the city spew fresh spring water that is still brought to the city by the ancient aqueducts. The water is delicious, clean, and free! 35. The Roman Forum has zero shade, bring an umbrella or hat in the summer. 36. Opt for an aperitivo instead of dinner every once in a while. Aperitivi are typically served from 7ish to 9ish. You pay for the drink, usually around 7 to 10 euros, and get to enjoy the complementary buffet. Trust me it is a ton of food. You get to try new Tuscan dishes and save money. Florence is small and the best way to see it is on foot. 38. Invest in the Florence Pass/Firenze Card. You get to skip the line and save money. But this only works for 72 hours, so group your activities accordingly. Click here to learn more. As gross as cow’s stomach and chicken livers sound, the Florentines consider them delicacies and they are delicious. 40. Climb the Duomo's cupola. You will get lost so why not embrace it? So many tourists only come for the day and Venice is very eerie at night. 43. Take the Vaporetto down the Grand Canal (for a much cheaper tour). 44. One Venetian gondola seats six. To save money, pack in as many as possible, since the price is per gondola not person. Finally, learn how to drink coffee like an Italian!